This Thanksgiving holiday weekend saw the top two contenders at the box office break multiple records. The “Hunger Games” sequel “Catching Fire” managed to hold onto the #1 spot, earning $74.5 million and bringing its domestic total to $296.5 million. Box Office Mojo suggests it’ll cross over to $400 million without a problem. However, while it debuted in second place, Disney’s “Frozen” managed to break various records of its own. The film earned $66.7 million at the box office, with a total to date of $93.3 million. Forbes notes even adjusted for inflation, this is second-most-successful non-Pixar Disney film debut ever (“The Lion King” still holds first place). Disney’s surely pleased at “Frozen”‘s results. Meanwhile, “Free Birds” made a huge plummet. Granted, it lost screens, but it still managed to fall from fifth place last week to fifteenth place (a 66% drop), earning $1.8 million this weekend. This brings “Birds”‘s domestic box office total to $53.2 million. With a $55 million budget, it more or less breaks even, but still won’t shake off the pun-filled “turkey” labels. 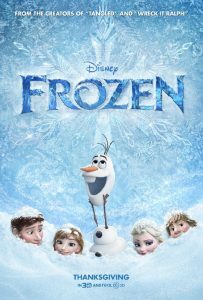 I suspect one reason “Frozen” did as well as it did (and “Free Birds”‘s free-fall) came from the lack of choices for children’s films in the past few months, other than “Cloudy With a Chance of Meatballs 2.” Now that “Frozen” is out, there’s something most families will deem worth seeing at a movie theater (and not tied to a specific holiday like Thanksgiving). The poor reviews on Rotten Tomatoes might bear this out.